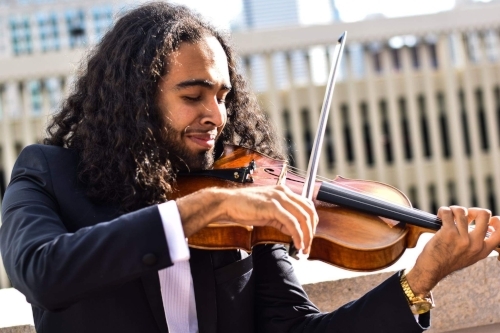 Miami native Srivishnu Ramankutty has had the opportunity to travel and perform in South Florida, Washington D.C, New York and Paris. He has performed in the Festival de Saint-Denis, the Metis Festival, the Eastern Music Festival and the Miami Music Festival. He completed his education at the New World School of the Arts/University of Florida high school and college. At New World School of the Arts he was a laurete of the concerto competition, performing Alan Shulman's Theme and Variations. He has had the opportunity to study with violists Richard Fleischman, Chauncey Patterson, and Michael Klotz. Collaborative and education opportunities included work with Lynn Harell, Anna Netrebko, Christopher O' Reiley, Michael Tilson Thomas and violists Robert Vernon, Cynthia Phelps, Rita Porfiris and Teng Li. Professionally Srivishnu has worked with the Miami City Ballet Orchestra, the Miami Lyric Opera, the Miami Symphony, Orchestra Miami and the Symphonia Boca Raton. Outside of music Srivishnu, honors a vegan diet while regularly rock climbing and practicing yoga.